Emily Parker Murgatroyd (1869-1944) was born in 1869, the second eldest in the family; her elder sister Ann was born in 1867. Their mother, Mary Jane Haley (1839-1875) died from either typhoid or cholera when her fourth child Alice Mary (1873-??) was only one or two years old. The young children were probably brought up by their quaker grandmother - Anne Parker Murgatroyd? Emily was a very capable woman. 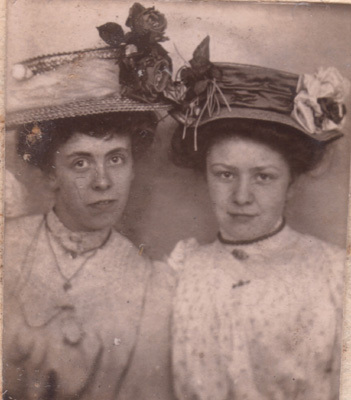 Her daughter Edith talked about Emily managing some catering establishment in Wakefield before she married. Alick Woffenden's daughter has a damaged but still charming embroidered sampler made by Ann Deighton (1817-1840) when a little girl, and quite a few family items and 19th century photos which are yet to be identified. These all came from Edith May Woffenden. Emily married James Woffenden (1869-1930) in the Parish Church of Newsome, Yorkshire on 5th March 1902 [1902Q1 Huddersfield Vol: 9a, Page: 515]. She was a spinster aged 27 and James Woffenden a bachelor aged 32 - a "weaver". Their fathers were Richard Woffenden (deceased) and Henry Albert Murgatroyd Grocer.The witnesses were Henry James Hood (her brother-in-law, husband of Ann Deighton Murgatroyd), and Gladstone Eastwood. For a while they lived at the Old Dolphin, an inn at Queensferry to the west of Bradford. Emily was the licencee, not James. During this time Annie must have stayed with them. Alick (Emily's son) recounted how he was nearly burnt to death as an infant in his cot while Annie was supposed to have been watching over him. Maybe a candle fell over or something. All four siblings inherited money from Henry Albert Murgatroyd and Mary Jane Haley but only Emily managed her inheritance carefully and probably baled out all three siblings from time to time. Emily found it too hard work managing the Old Dolphin which still exists. It was on one of the main routes west across the Pennines, Alick remembered teams of packhorses, and remembered the men stopping for bread and cheese and ale on their way. When James and Emily left there, Emily invested some of her capital in a terrace of houses - Peterborough Terrace, Undercliffe, Bradford. They lived in the end terrace house themselves, and the rent from the others provided a modest but steady income. Their children Edith and Alick grew up there. James died even before his son Alick met his future wife Elsie. Emily continued to live at 29 Peterborough terrace until her death on 1 July 1944. Her daughter Edith lived with her until then. Emily had asthma and was bedridden towards the end. It is believed that she broke her hip and then got pneumonia which for an asthmatic at a time before antibiotics was fatal. The photo of Annie and Emily we think shows Annie on the RIGHT. Her parents were Henry Albert Murgatroyd (1844-1918) and Mary Jane Haley-Murgatroyd(1839-1875). His parents were Richard Woffenden (1836-before 1891) and Elizabeth ??-Woffenden(1836-??). Emily Parker Murgatroyd-Woffenden was my Mother's aunt, and her son Alick my Mother's first cousin. This information about the Murgatroyd Family tree has been collated and published by Malcolm Rigg based upon the research of my cousin Mal Pace-Smith in NZ, and with information from a second cousin (daughter of Alick Woffenden).